Hi everyone! Today I want to show you a set of Halloween cards that I made for my Mom using the Frightful Night set and a Perfect Package Card Box. If you haven't seen Taylor's video tutorial yet on how EASY these boxes fold together, check it out here. Don't forget...If you haven't yet signed up for the Taylored Expressions newsletter, stop by the homepage and add yourself to the list. These are fantastic! Love that box! So CUUUUUUUUUUUUUUUUTE! I just love halloween cards, and your are fanTAStic! 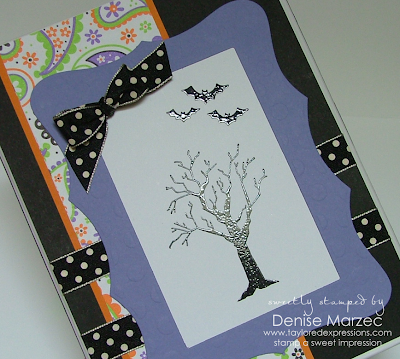 Great Halloween cards, Denise!! I love your embossing and polka dot ribbon!! Hi Denise! I love this card set!! They are so pretty and fun! OMG...the deckled edges are just perfect for Halloween theme, too!! What wonderful cards. I love them! Very understated, yet they speak volumes. I've got to see what trees I have!! !